"I see a day when we will go beyond music, clapping, singing. When silence will fall and we will see Him as we have never seen Him." God was Daniel’s Solid in a world of shifting chaos. Daniel’s stability did not rest on his own character, his knowledge or even his faith. 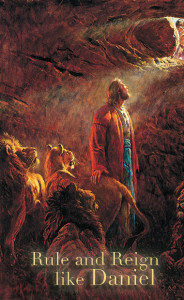 Daniel’s immovable success was his living relationship with the Most High. That hidden core of his heart, that secret place of his affection—this was Daniel’s unfailing Source for every situation.